H.J. (Johannes) Witteveen (1921) is best known as managing director of the IMF in 1973-1978. Please note that the Bretton Woods Institutions IMF and Worldbank have wrong names. J.M. Keynes already complained to the Americans: "The Fund is a bank and the Bank is a fund !" (no exact quote). It would be better that the IMF is renamed to World Central Bank and the Worldbank into World Investment Bank, since this would strengthen their role and position also in public perception and discussion. Following the First Oil Crisis 1973-74 Witteveen created the Supplementary Financing Facility, unofficially known as the Witteveen facility, to channel revenues from oil producers back to the consuming countries, to prevent a liquidity crisis amongst those consumers. The IMF book by James Boughton "The silent revolution" assigns a later major role to Witteveen's successors Jacques de Larosiere and Michel Camessus, but underestimates how Witteveen paved the way. In the current crisis of 2007+, Witteveen pointed to requirements for a New Bretton Woods (Nov 20 2008, Financial Times). For Europe he advised a similar "facility" again by the IMF rather than the ECB (Aug 22 2011, Financial times, Business Insider). Below, Witteveen looks at the Dutch export surplus and the need for an investment strategy in The Netherlands itself. We can observe that the Dutch surplus exists since 1981. When Germany started copying that, Southern Europe got into problems. I tend to agree with Witteveen on IS-LM but advise at the level of each nation: (a) an Economic Supreme Court, (b) National Investment Banks (NIBs), (c) the overall approach to reduce unemployment as discussed in my book DRGTPE. My pre-crisis book is Definition & Reality in the General Theory of Political Economy (DRGTPE). My 2007+ papers on the crisis are collected in Common Sense: Boycott Holland (CSBH). A boycott of Holland is warranted because of the censorship of economic science by the Dutch government. That censorship pertains to the issue discussed below, and professor Witteveen's discussion suffers seriously from not having the material under censorship. Witteveen had been professor at Erasmus University since 1948. Apparently he never got time for an official farewell, and last week the old fox took the opportunity of a Valedictory Lecture to gather an audience and to present his analysis on that Dutch investment strategy (May 15 2014). The Lecture was published by the Dutch economics journal Economisch Statistische Berichten (ESB May 17 2014 p294-298). I thank the editors for permission to reproduce the lecture with my comments. Witteveen also wrote books on universal sufism (not to be confused with islamic sufism), see his personal website. As a personal remark on my side: my father is also from 1921 but has stopped reading and writing. I am much impressed by Witteveen's command of economics. Admittedly, Keynes solved these issues by IS-LM itself already in 1936 and by his proposal for an international trade currency (bancor). Our main problem since 1945 has been that politicians arrogantly proclaim to know it better. Witteveen's Valedictory Lecture is a major event in economics. It deserves to be treated with much respect and critical comment. It shows that the problem is not lack of knowledge from economic science but that the problem lies in the structure of decision making about economic policy. The Dutch surplus actually started in 1981, see my 2009 paper "A macro-economic lesson from Holland". See The Economist "Model Makers" May 2 2002. In our public discussion very little attention has been given to this remarkable aspect of our economy, neither in politics nor in announcements of the Dutch Central Bank has any attention been given to this. Perhaps because it seems to throw some doubt on the need of large economies by the government. In the European Union there is a rule about balance of payments, deficits and surpluses. Surpluses should not at any length of time be higher than 6% of GDP. But neither the European Commission nor the Dutch government seem ever to have evoked this rule in discussions of the budget deficit. Well, I tried to do my best, see the above 2009 paper. See my own VoxEU column and this weblog. In Dutch, see these two entries on Joop.nl: a link to the Great Depression, and a warning for the risk of a greater crisis. Thus, our enormous balance of payments surplus does not force us to a more expansionary policy, although in itself it would create a tendency for a certain growth of the national income that would increase imports and therefore reduce the surplus. The extra income increased in this process would then also increase consumption, tax payments and savings. A stationary situation would be reached when the total of additions to the income stream would equal the leakages from it. This would be when the budget deficit and the payments surplus would together equal the saving surplus. In this way, a multiplier process can be put in movement, showing how much the income would increase as a consequence of an increase in exports, or otherwise, of additional government expenditures. The size of this multiplier depends on how much of extra income flows away from the income stream by imports, savings or taxes. It is also important then in how far these savings would cause larger investments, so that there would be no leakage anymore and whether additional tax receipts would be spent by the government. (1) It does not have to be favourable at all. If the reserves are held in a currency that is depreciated, one loses. It may be better to directly spend the sums so that there is no surplus. We see China accumulating dollars, that later however may depreciate. They may buy up companies in Europe while Europeans are under the money illusion that those dollars are still valuable. (2) Yes, the EMU works out as a gold standard. While Americans had learned that the gold standard wasn't so smart (because of the deflation in the Great Depression), the EMU-designers targetted it (because of the German fear for hyperinflation). See my paper Money as gold versus money as water (2013) Also see this paper for the reforms discussed below. The ECB is very prim on printing money. But we don't mind when the USA does, and when China earns those dollars and then starts shopping in Europe. See also Jens Weidmann: "We are not lemmings" while Germans are lemmings on the fear for inflation. (4) The savings - investment issue is quite complicated. The current situation is also special. (4a) The years 1981-2007 were also Keynesian years because of the deregulation. (4b) Investment bankers are like spoiled children. They could invest in anything in those years and take huge risks (ICT, dotcom) and still show a profit, but now face risks they cannot deal with. We urgently need national investment banks. In the present Dutch situation, we have a balance of payments surplus of more than 9% and a budget deficit of 3% of GDP. That means, that there should be a savings surplus of no less than 12% of GDP. That is the other side of the balance of payments surplus. How should we judge that? There are two components of this savings surplus: business saving in the form of retained profits that are not used for investment in our country; and the savings of pension funds and life insurance companies that are not invested within our country. There are no exact figures on the size of these components. But we know from an investigation by DNB that only 14% of the investments of pension funds stays inside our country. As these savings are more than 6% of GDP, it follows that their contribution to the savings surplus must be 5% of GDP. That would then leave 7% of GDP for business companies. This saving surplus has helped to bring down the rate of interest to levels below 2% but investment did not react to this with an increase. In this way a recession developed. This failure of an equilibrium mechanism on the capital market is the essential element of the theory that J.M. Keynes developed in 1936 (The General Theory of Employment, Interest and Money). The experience during this recession completely confirms this theory. But it is disappointing that policy makers in Europe seem to have completely forgotten these relationships. In the United States, this is also the case in the Republican party, but the chairman of the Federal Reserve system, Ben Bernanke, has shown clear insight in the business cycle mechanism, but could only instigate a very expansionary monetary policy because congress left too little room for stimulating additional expenditures. These are important observations. A point is that such relationships aren't "forgotten". The label "forgotten" puts you on the wrong foot. There was and is competition from a false theory. That false theory or ideology is the "need of austerity to create investor confidence again". If something is merely forgotten, then it would be easy to remind people about it. In this case, policy makers have been reminded about it, but this didn't help, because they relied on another theory. That false theoy didn't work and the recession and stagnation continued. This was interpreted as only more evidence that more austerity was needed ... These policy makers and their economists aren't scientists but they form a cult with almost religious faith in Reaganite / Thatcherite "neoliberalism". It is important to observe that much money was squandered in Southern Europe. The USA had its frauds too. But we have to recognise that the development of economic science has a great responsibility for this. After the Second World War, new economic theories have been developed on the basis of “rational expectations”. With that assumption they could build on earlier equilibrium theories, as for example the system of Leon Walras (16th December 1834 – 5th January 1910), who formulated a general economic equilibrium with beautiful mathematical equations. These new theories made far-going assumptions, for example letting all markets would always exactly and immediately reach an equilibrium. All economic subjects would act rationally for their own interest and they could completely foresee the future. Because in the markets all economic subjects together create an equilibrium that reflected their preferences, government intervention would not be needed. The inventors of these neo-classical [bold TC] theories, as for example Robert Lucas Jr. (American economist, 15th September 1937 - ) have won Noble prizes in economics and were rather generally supported. In these equilibrium systems there could therefore be no business cycle. As there is clearly some fluctuation in the real world, theories were developed that explain fluctuations by changes in real data for the economy. In this way, economists have created a “platonic world” of perfect efficiency, as Robert Skidelski put it in his clear and amusing book “Keynes, the return of the master”. That world has little to do with the real world of unexpected events, mass psychological reactions, with are often unreasonable and dangerous disequilibria. But the political visions developed in the Reagan-Thatcher revolution were strongly influenced by these neo-classical [bold by TC] theories. These theories were in tune with their political instincts: budgets should be balanced and monetary policy should only be focused on price stability and carried out by independent central banks. The unfortunate deregulation of the financial sector in the United States by the repeal of the Glass-Steagall Act also resulted from this thinking that saw all markets as working perfectly. What professor Witteveen calls "neo-classical" should be "neoliberal". This does not nessarily mean that we have a complete model how this would work, but the ideas are guiding. PM. Keynes himself already adjusted the classical approach, thus essentially was a neoclassical economist too. Thus Samuelson's "synthesis" is a bit overdone. But the word has been accepted in the literature. (2) The Lucas critique was mainly a technical issue. The idea that forecasts can be self-defeating was already known. (3) The revolution by Reagan and Thatcher didn't come from new theory but from policy failure in the period before that. Policy makers didn't properly implement ideas about the Welfare State. As unemployment and inflation exploded in the 1970s, ideologues against the Welfare State gained the political upper hand. The new theory of "rational expectations" and "supply side economics" was only embraced in the capitals of the world because it suited that old ideology. (4) Dutch readers may look at my discussion in 2013 of the impact of Margaret Thatcher on the Dutch Eduard Bomhoff and Mark Rutte respectively. (1) Did it start only after 2000 ? I haven't looked at that particular IS-saldo since 1981 (and haven't even looked whether I could get those data). But above we saw the surplus on the external account, and it stands to reason that this is reflected in IS. But Holland has been losing a lot of capital on investments abroad, so beware of the distinction between ex ante (expenditure) and ex post (effect). This also shows that saving and investment in the Euro Union and in the core countries of the Euro Union remain close together and are at a much lower level. So, we can say now that this large saving surplus is a rather unique Dutch phenomenon. [bold by TC] We must see that as a serious disequilibrium in the economy for although it means that our national wealth increases, it also implies that our production capacity expands inefficiently, so that not enough employment is created for our workers. This could lead to structural unemployment, which would be very damaging, bringing suffering to a part of our working population and limiting growth of our national product. (1) I would need to see the graph for Germany separately before accepting the "uniqueness" of Holland. (2) This story is proper from traditional international economics. The government has worsened the recession by a policy of severely cutting the budget deficit, in order to satisfy the European maximum of 3% for the budget deficit. European policy makers were strongly influenced by Germany and by the neo-classical economic theories [bold by TC] in setting an aim for the necessary coordination of budgetary policies in the Eurozone, so that the final aim has been set very low, at 0.5% while the earlier goal of 3% became an absolute maximum. As most European countries have large budget deficits and the recession tended to increase the deficit still further, this led to very severe and painful austerity measures. In the Netherlands, the budget deficit was still very low at 0.8% in 2000 but in the recession – with falling tax receipts and rising unemployment expenditures – it increased to 5.6%, and that notwithstanding severe budget cutting policies the deficit remained above 3% until 2013, when the recession seemed to end. These budget cuts of course decreased incomes and caused unemployment – setting in motion a negative multiplier mechanism. Economic studies in the International Monetary Fund made it clear that these multipliers were much larger than assumed in the past. Different estimates have been made of this multiplier. It has become clear that the size of it depends on the business cycle situation. In a situation of full employment and fully used capital equipment an increase in savings would also give larger room for investments but in a recession, that would not be the case. On the contrary, investments would also fall because of the reduction in demand. In that way, a savings surplus would result. The rate of interest might fall but this would not lead to a larger investment as is assumed in classical economic theories. In the Central Economic Plan of 2013, the conclusion is that in this recessionary situation these multipliers are much higher than one, so that expenditure cuts would scarcely succeed in reducing the deficit. In this way we are pushed into a negative vicious cycle: budget cuts reducing incomes that diminish tax receipts and increase unemployment benefits so that the budget deficit increased again. Thus, expectations that deficits would come down were disappointed every time. This unfortunate process caused great losses in production and the painful experience of the growing number of unemployed and bankruptcy of many small-scale companies. In the Netherlands, unemployment now is around 8%; in some of the southern European economies much higher percentages were reached, hitting especially younger workers. Of course, this also made the European Union very unpopular. This is the tragic consequence of the total lack of Keynesian anti-cyclical budgetary policies. It is indeed time for the “Return of the master”, as Robert Skidelski suggested. (1) The EMU rules are based upon some ideas. One idea is to get more control over budgets in Southern Europe. (2) Yes, Germany, but not "neo-classical" but "neoliberal" and "Friedman-monetarist". I am a neoclassical economist in the sense of Paul Samuelson (see his thesis). See point H.
(3) Yes, the final aim is 0.5%. This Eurozone target is strangely absent in the debate in Holland. Minister Dijsselbloem announced that the recession is over, and the budget deficit dropped below 3%, but he did not mention that the target now is 0.5% so that we might get into a third dip. (4) With apologies to Olivier Blanchard: Those estimates only reflect the data, and you already have those data ... The use for analysis differs from that for forecasting. The IMF discussion on the multiplier compares a bit with the discussion about the number of angels on a pin. Above analysis on the regime change from pre-2007 to post-2007 is much more important. A decision to institute an Economic Supreme Court (ESC) and National Investment Banks (NIBs) must be based upon such a wider analysis, not upon such estimates on the multiplier. (5) The CPB-models tend to be neoclassical too, since they clearly allow for negative cycle feedback. But they are deficient because of the censorship. They tend to be neoliberal rather than "on the classical side" of the Keynesian synthesis. (6) You cannot simply ask for the "Return of the master". The situation is now different than in 1936 and 1945. If you put yourself into the mind of J.M. Keynes (i.e. try if you can), you might agree with some suggestions of mine from 1990: see my books DRGTPE (pre-2007) and CSBH (update on crisis particulars), see here. (7) Unfortunately, Robert Skidelsky also proposes a Basic Income. This abolishes the Welfare State and doesn't provide for ESC and NIBs. Robert Skidelsky is much too subtle to show cult sect behaviour, but many adherents to the Basic Income show cult sect behaviour. Nevertheless, we have to ask: how and in how far Keynes can return in the present situation? The situation in Europe is now in two aspects quite different from that in the United Kingdom in 1936, when Keynes wrote his “General theory of employment, interest and money”. In the first place, there are limits to the possibility to finance budget deficits. When government debts increase too much they can cause an escalating crisis where the payment of interest increases the budget deficit further and further. Repayment of the debt becomes then more difficult, so that investors want higher rates of interest for financing the deficit. In this way, the financial markets acquired a very important role in the European Union. In the beginning of the Monetary Union, they made it very easy for some countries to profit from the lower European interest rates. But this situation turned sharply around when the crisis came and the rates of interest for loans of these countries increased unsustainably. That many investors in these markets have also been influenced in their thinking by neo-classical [bold by TC] theories made these barriers so much stronger. (1) Professor Witteveen read the Central Economic Plan 2013. But he is not aware that the directorate of the CPB has been censoring economic science since 1990. (2) The CPB directorate does not acceptthat the crisis confirms my analysis since 1990. (3) Also the IMF is not aware of the situation. See my email to the IMF IEO integrity office, on which I did not receive a reply. So, what kind of policies could a Keynesian European Commission and Council have followed in this situation of our Monetary Union and what policies should they follow now? It seems to me essential to make a clear distinction between structural deficits and temporary cyclical elements in the budget. The structural deficit is what would result if normal growth would continue with reasonably fully occupied production capacity. This structural deficit will often be hidden by cyclical influence on tax proceeds and spending. It is very necessary that this structural deficit is kept below 3% or less of GDP. That is a difficult task, for there are many categories of expenditures that have a strong tendency to increase more than national income. The expenditures for our health care are a clear example. The continuing improvement of medical technology often causes huge increases of cost and, as we live longer – also because of this improving health care – more older people require more expensive care. There is also a growing need for social care at home for older people. (1) The distinction between structure and cycle is old. See the Cees van den Beld CS model at the CPB. (2) The problem is to estimate what investments contribute to the long term. Is the government to know better than investors (say those in Google Inc.) ? (3) Neoliberals hold that austerity is required to restore "confidence" in capital markets. This however is a political ploy to destroy the Welfare State. It is okay if they are clear about their objective, but it is not okay if they hide it behind texts that suggest science while it isn't science. A very different factor is our system of deducting interest of mortgage payments fully from taxable incomes. This has caused large reductions in tax receipts and has created a “bubble” in the housing market. It has given us a relatively high mortgage debt, which becomes painful as house prices have fallen. Besides all such influences, there are in many countries – not so much here in our generally so well-organised country – increasing expenditures, favouring certain groups in the population that have been granted for political support. So, it is an essential task for governments to push through structural reforms of these expenditures and of course also to abolish unreasonable favours or “political clients”. When Keynes would now be living he would certainly fully support such structural measures. (1) The Dutch housing market is an example where an Economic Supreme Court could have worked wonders. It shows that a CPB with its weak position doesn't help. (2) However, there are many such examples. But in a recession, such measures have the great disadvantage that they reduce incomes and cause the vicious spiral of a shrinking economy, as we have seen. What Keynes then could have done is to combine these permanent structural reforms with temporary stimulating measures that would help the struggling economy but would not increase the structural deficit. For this purpose I have as Minister of Finance in 1970 created a mechanism – with the unanimous support of parliament – of temporary additions or deductions of maximum 5% of the most important taxes. These changes could be introduced immediately for reasons of business cycle policy by the government with approval of parliament after their introduction. In that way, the government could act quickly, which is very necessary in business-cycle policy. I have used this so-called “wobble tax” myself to put a break on the economy in 1970 when it was growing too fast and my successor increased this temporary tax increase still further and abolished it afterwards. After that, it has never been used. It could have been used now as a strong antidote to the overpowering negative influence of structural expenditure cuts. (1) Well, the EMU decided to other rules. Curiously, Holland accepted the Zalm-norm as an improvement on budgettary rules, but Zalm did not negotiate this rule for Europe. (2) Holland is in the Eurozone. If it would not accept the EMU rules while it has only an unemployment of 8%, how can it argue that Southern Europe should do so, that has a much higher rate of unemployment (Eurostat 12-26%) ? Besides this, the government could also increase the investment in needed infrastructure that could be financed now with an exceptionally low rate of interest and that would then alleviate budgetary problems later. I have suggested several times an acceleration of implementation of the Delta Plan for strengthening our defences against the rising sea level that we have to expect. Eventually, this could be financed through a special fund in order to keep it separate from all other expenditures under the austerity regime. An important aspect of such a policy stance is that the government would be able to show confidence in the future. As I will show in my conclusion, basic confidence is an essential need for our economy at the present time. It goes without saying that our large balance of payments surplus will give us ample room for such stimulating measures. They would also be favourable in the context of the European Union, because they can help the weaker countries with balance of payment deficits. Although the separate balance of payment situation for individual European countries are not visible in a monetary union, they still exist and would cause financial flows between central banks. It remains be necessary for the European Union gradually to move closer to balancing internal European payments. (1) "Delta Plan" has already been used for the past. It is better to use a new label. If you want to do something w.r.t. global warming, then it is proper to explicity say so. See my book on the Tinbergen & Hueting approach to Ecological Survival. (2) If Holland is allowed to do so, why not Southern Europe ? Will they not suffer from global warming, e.g. more heat in Summer ? (3) For the creation of Bretton Woods, Keynes already explained that the surplus countries had a higher responsibility to work towards a solution than the deficit countries (who were forced to import). A very different limitation for Keynesian budgetary policies follows from the fundamental international shift in the relative scarcity of different factors of production. It was Professor Bertil Ohlin (Swedish economist, 23rd April 1899 – 3rd August 1979), who analysed how the structure of international trade depends on the relative scarcity of the main factors of production, labour, capital, and entrepreneurial capacity. As a consequence of the increasing efficiency and therefore lower costs of international transportation and communication, some low-income countries have now been able to fully engage in international trade, becoming “emerging economies”. This means that the great abundance of labour for example in China, where more than one billion people still live in absolute poverty, makes it possible to produce labour-intensive products very cheaply. This has a great impact on the industrial countries that could not compete with these cheap products, so that they imported them. This made labour in their countries relatively more abundant. In relation to this, capital became scarcer because many capital installations need to be replaced or adjusted to the new scarcity and price relationships in world markets. In the United States this resulted in a relative lowering of real wages that did not increase in the last ten years while productivity continued to grow. Against this, profits increased and especially entrepreneurial income went up in sky-high bonuses. In Europe, similar tendencies can be seen. With respect to Keynesian policies this scarcity of capital means that the industrial countries need to increase savings. That can be an argument to aim for low budgetary deficits. Germany’s policies then fit into this fundamental situation. 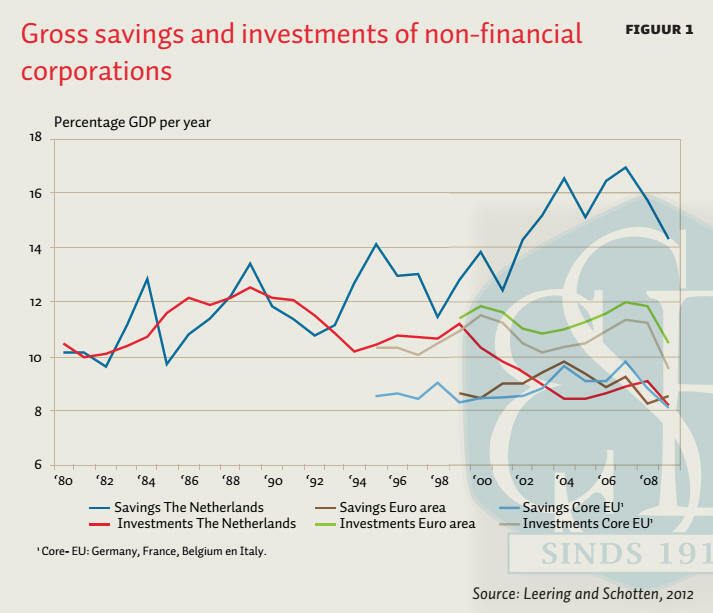 For the Netherlands however, with its large saving surplus, the problem is rather to bring business investments to a higher level. (1) Agreed in Bertil Ohlin. (2) Trade and technology improve welfare, and are not a cause for unemployment. (3) Unemployment is caused by a wrong implementation of the Welfare State. (4) The neoclassical analysis must be amended with ESC and NIBs to close holes. (5) The problem is not lack of savings. The problem is the lack of investments. In the classical economy of J.B. Say the idea was that S drives I. But Keynes discovered that the economy had changed, and that I drives S. Putting money in the bank doesn't do much, except losing value if there are no investments. This brings me back to the beginning of our large structural saving surplus. There are two aspects to this. We have seen that we now have a savings surplus of approximately 8% of GDP in the non-financial business sector: high retained profits and low investment. The other element is formed by the savings from pension funds and life insurance companies of 6% of GDP. How can this be explained? As Schotten and Leering  point out, elements in this situation can be that we have a relatively large number of multinational companies that have their head office in the Netherlands and that then receive dividends from daughter companies in other countries. Dividend payments in our country are relatively low and the sharp decrease of the rate of interest has also helped. But a more fundamental factor seems to me that international capital movements in recent years have increased strongly. Limiting government regulations have been mostly abolished and financial communications have been improved. In this way, the emerging economies like China, Brazil and others can grow very strongly and therefore, they attract large capital imports. Multinational companies can then see more attractive investment possibilities in these countries than here. This is of course an aspect of the change in relative scarcity of the factors of production – labour and capital – that I mentioned earlier. The resulting scarcity of capital shows itself here by large outflows of capital in the form of direct investments or participation in shared capital of foreign companies. Dr. J. van Duijn, who wrote a very penetrating article about our economic disequilibrium,  sees here also a shift in power from labour to capital with lower real wages and higher profits as a result, a tendency strengthened by the general lowering of profit taxes. An interesting aspect of this development is also that large companies are more easily taken over by competitors and have to defend themselves against this or prepare a take-over other companies themselves. This leads to accumulation of large cash-holdings. Schotten and Leering mentioned these also and see this as a precaution against greater economic volatility. (1) Holland has been mentioned as a tax haven. However, if profits are redirected to flow over Holland, they come in but also go out, and there should be no big saldo effect. Ftnt 4: Dr. J. van Duijn, De economische crisis en de aanpak ervan, Tijdschrift voor Openbare Financiën, jaargang 45, 2013, nummer 4, blz. 180. Both references suffer because of lacking the material that is under censorship. This raises the question how governments should look at all this. The present paradigm includes complete freedom of international capital movements. The idea is that efficient markets know best. But apart from the question whether it is always best for shareholders, large take-overs can sometimes clearly damage the national interest with respect to employment and growth. It is clear that governments of the larger European countries sometimes interfere, visibly or invisibly. It seems to me that in our small country – although still medium-sized with respect to economics – the government should have the power, as in the United Kingdom, to veto large take-overs when they consider them not in the national interest. With such a power our government could have prevented the very unfortunate and destructive take-over of ABN AMRO by Fortis, the Royal Bank of Scotland and Banco Santander. Our central bank – de Nederlandsche Bank – foresaw great difficulties from this take-over but the government saw no possibilities to act. The result was finally that we lost a large network of foreign bank offices that had been built up over centuries and that had been very helpful for our exporters. Banking services were also an export category where we had a comparative advantage. So, this was a loss for the national economy. Apart from this, the relatively low level of our investments is an argument for a fiscal regime that is more favourable for investment and innovation. Research spending should be stimulated and we should have ample opportunities for accelerated depreciation of investment expenditures that can be a very effective stimulus to investments. This could also be variable as an instrument for anti-cyclical policy. The ABN AMRO bank case is a minor issue. Interestingly though, the director of the CPB who started the censorship of science is Gerrit Zalm, now CEO of ABN AMRO. My position w.r.t. Zalm is strictly business. Perhaps he was disinformed himself. I have not been witness to all what happened, and my advice is a parliamentary enquiry to find out. Zalm was member of the PvdA but switched to VVD in 1984, i.e. during the period of Reagan and Thatcher as well. He worked within the bureaucracy of the Ministry of Economic Affairs and had no real background in scientific research when he was catapulted into the directorate of the CPB in 1988. We see this same happening with the new director appointed last year. If the censorship had been investigated and ended by parliament in 1991, then Zalm likely couldn't have become minister of Finance in 1994 (even if he was disinformed but then jumped to conclusions, and of course it remains politics). Then there is also the question of a lack of financing. This plays a role for medium and small-scaled businesses and that brings us to the other element in our saving surplus: pension funds and life insurance companies. Our government has seen the great potential in these enormous savings that now flow for 85% out of the country. It has engaged these institutions in discussions to induce them to increase their financing in Dutch business. This discussion seems to be deadlocked however, because these institutions fear that the return on such credits would be relatively lower. Therefore, they ask at least for government guarantees, which the Minister of Finance naturally is not prepared to give. Is there a way out of this deadlock? Then we have to recognise that the present supervisory rules that force these institutions to aim for the highest possible returns, are completely unreasonable. They are unreasonable because they require the funds to build up a capital from which all future obligations for the next 30 to 40 years can be financed at the present exceptionally low rate of interest. If we would moderate this accounting rule by taking the moving average over the last ten years of this rate of interest, their financing problems would be alleviated and these institutions would have more room for credit to medium and small-scaled businesses with lower returns. Against this, the government should then re-introduce a maximum for investment in shares and participations in large corporations, which is the largest share of the total investments of pension funds: 323 billion euro of a total of 959.6 billion euro. The regulation of the pension funds is a minor issue. Relevant are the ESC and NIB, and my general solution approach to unemployment. When the economy comes properly regulated with those measures, what to do with the pension funds then is basically an issue of equality. It shouldn't be that workers who with a high degree of likelihood die before age 65 actually pay for the pensions of government officials who with a high degree of likelihood live much longer. A pension proposal in Dutch is here. (1) Agreed on "lack of confidence, of trust". But this can be quite realistic in the current economic conditions. (2a) Economic planning, for which a CPB fails, and we need an Economic Supreme Court (that respects science). This also holds for the Council of Economic Advisors in the USA, because of lack of independence within the constitutional framework. (2b) National Investment Banks that work countercyclically. (2c) Overall commitment to low cyclical unemployment of some 2%, with a properly implemented Welfare State. Ftnt 6: John Maynard Keynes “The general theory of employment interest and money”, pages161-162, published by MacMillan and Co., Ltd, London, 1946. Keynes writes there: “But individual initiative will only be adequate when reasonable calculation is supplemented and supported by animal spirits, so that the thought of ultimate loss which often overtakes pioneers, as experience undoubtedly tells us and them, is put aside as a healthy man puts aside the expectation of death.” Just to be sure: Aristotle distinguished between dead matter, living plants and animal life. In Latin the latter was indicated by the "spiritus animalis". This is quite different from behaving like an animal, though pupils at English boarding schools tend to make that joke. I would add that human beings, faced with all the changes and dangers of the future in the material world, can always find astounding strength and insight in their inner life. But we have to discover these turning our attention from the outer material world to the inner spiritual world so that the One Source of Energy, Life and Light can be found. What we need is the power of confidence: Faith! With all respect: I can honestly say that I apparently don't need to tap into some inner source that apparently still would be somewhat external since it would be shared with all others. On my automatic pilot I wake up each morning with joy in what the day will bring, and I hope that this transpires in my work. Still, this is a Valedictory Lecture and we can only respect professor Witteveen for closing it with a statement from his heart. When we meet a troubled person why not indeed suggest that they look into universal sufism ? Overall, this economics discussion is of key relevance for the understanding of the economic crisis, both in Europe and the United State, and, indeed, the world. I am much impressed by professor Witteveen's grasp of economic theory and understanding of the present situation. It also shows that Keynes already lay the foundation in his General Theory and his work on Bretton Woods. Those essentials haven't changed. Progress since then has been on detail and technical issues (compared to this). Our economies have been suffering from the arrogance of policy makers who did not respect the essentials. The solution lies in curbing the political powers and prevent them from transgressing into science. PM. The paragraphs are identified with letters, that also can be used as targets for specific #letter links.